Business has blossomed for Adams Direct & Media Services (East Hanover, NJ), and their direct mail side is attracting larger clients. That growth has triggered various equipment upgrades, including the purchase of a 30″ Prism® paper cutter from Colter & Peterson (Paterson, NJ) in 2012 and recently, a 31.5″ Prism from the same source. James notes that his Prism cutters are already getting a workout every week, and he’s been impressed with the many benefits they have to offer. “So far they have met all our expectations,” he says. “The Prisms are very reliable, easy to operate, and our operators like them. They change out the blades on a regular basis, and it doesn’t take long to do.” Both are outfitted with the Microcut® computer control system. Nearly everything that Adams Direct produces is customized variable data printing, 95% of which is mailed. The shop also uses an on-site postal office to optimize postage savings for its clients. James, who began working at Adams Direct in 1986, has guided the company for the last 20 years. Owned by Lillian and Allan Adams, it serves insurance, healthcare and pharmaceutical clients in the Pennsylvania-New York-New Jersey area, with some national accounts as well. Adams Direct also offers cross media marketing and fulfillment and kitting services. From left, Zenger Group owners John Zenger, Joe Zenger, and Steve Zenger. 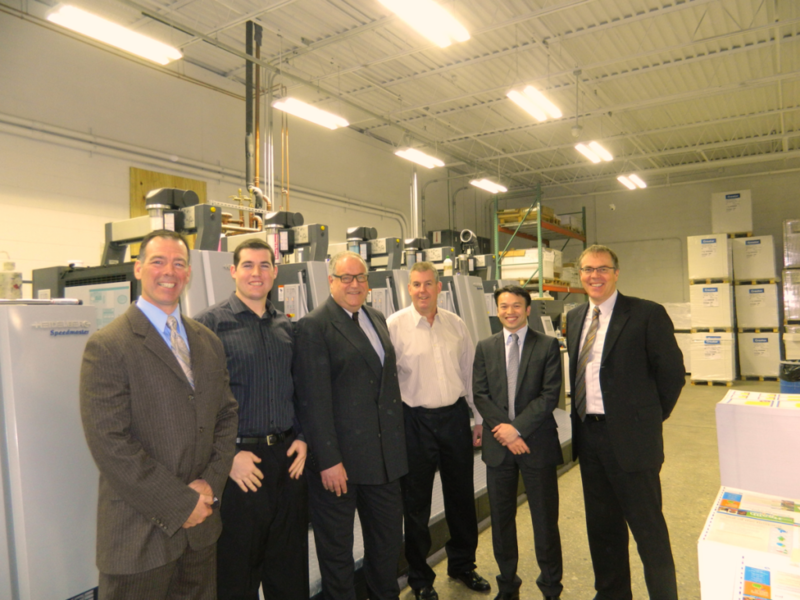 Zenger Group, Inc. reports the installation of a Heidelberg Speedmaster XL 106 eight-color perfector with Prinect Axis Control at its new corporate headquarters and plant in Tonawanda, NY. The new press takes the place of an early-generation Speedmaster XL 105 at the Zenger Group’s Orchard Park, NY facility, one of three plants to be consolidated into the new facility. Capable of production speeds up to 18,000 sph in straight or perfecting mode, and with effective quality assurance via the Prinect Axis Control color measurement system, the new Speedmaster XL 106 will significantly increase Zenger Group’s capacity and broaden the scope of its manufacturing capabilities. Central control of the pressroom is managed via Prinect Pressroom Manager. Zenger Group has been a leader and an innovative force in the western New York’s printing industry for more than 30 years. From left: Dan Dibble, Angela Halloran, Matt Pryor, Michele Muccino, Mark Deloia (owner), Anthony Bracco (owner), Mike Ambrose (owner), Frank Segui, and Daryl Canuzzi. Already running static jobs from one to 1,500 sheets on the new digital press, the company is quickly ramping up its variable data expertise. 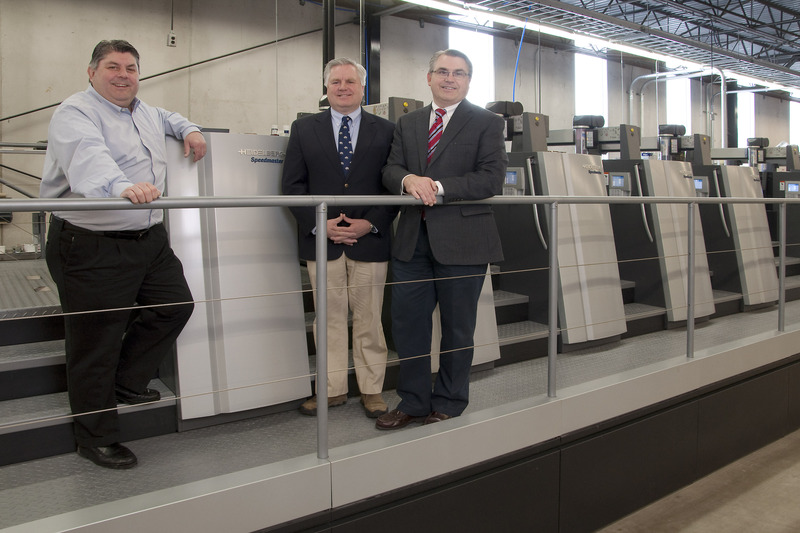 With annual sales in the $2.3 million range, Prospect Printing serves customers throughout the Northeast. 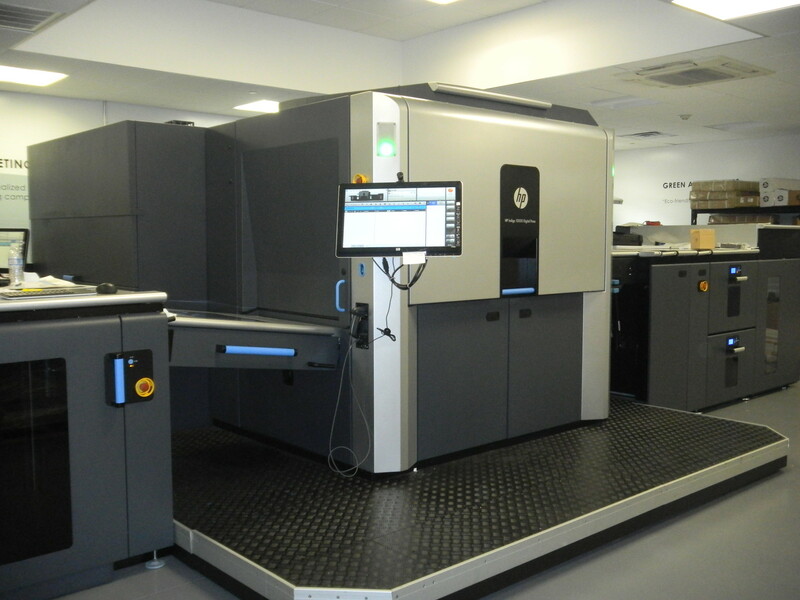 The Linoprint C751 is the company’s first digital machine. 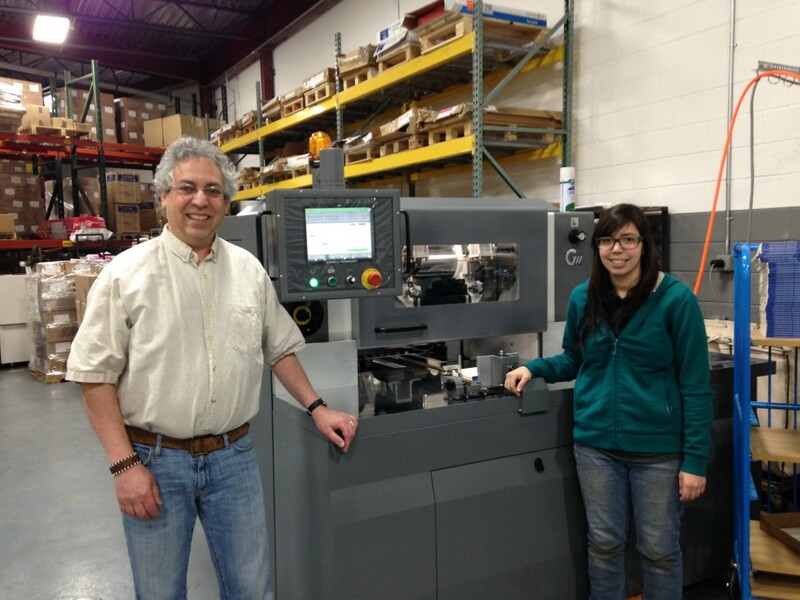 Al Ryan, president of Blauvelt Printing, at the company’s new Heidelberg Speedmaster CX 102 offset press. 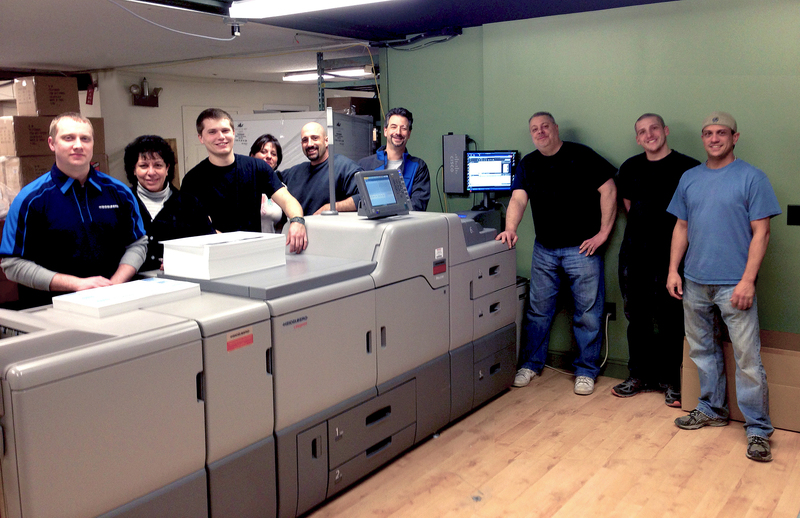 The installation of a five-color Heidelberg Speedmaster CX 102 press with Inpress Control, aqueous coater, and extended delivery earlier this month marked a watershed moment for Ryan Printing (Blauvelt, NY). The new press heralds the one-shift operation’s transition from a half- to a full-size shop with competitive firepower to spare. Thanks also to the cartridge-based InkStar ink supply, the company enjoys the benefits of fully automated ink feeding and reduced startup times by eliminating the need to skin ink cans prior to filling the fountain. The additional benefits of less wasted ink and continuous monitoring of ink levels through the Prinect Press Center Console ensure the highest quality without sacrificing the ability to change inks flexibly. The addition of the Speedmaster CX 102 also will enable Ryan Printing to expand its packaging business. Not only will the company gain tremendous flexibility in handling substrates from lightweight paper to 40-pt. board stock, but Prinect Inpress Control will keep brand colors consistent and reduce waste to a minimum, advancing the company to a higher level of production capability. In choosing the Speedmaster CX 102, Ryan Printing also has strengthened its commitment to environmental protection, based on the low energy usage, resource efficiency, and long service life that make the Speedmaster CX 102 the most environmentally friendly press in its class. The CX 102 is ideal for reduced-alcohol and alcohol-free printing, while color measuring systems such as Prinect Inpress Control reduce paper waste on average by 200 up to 400 sheets per print job and lower the level of CO2 emissions. In addition, environmentally friendly cloth blanket wash-up devices use water and solvent to reduce the overall amount of solvent used, yielding savings of up to 90%. 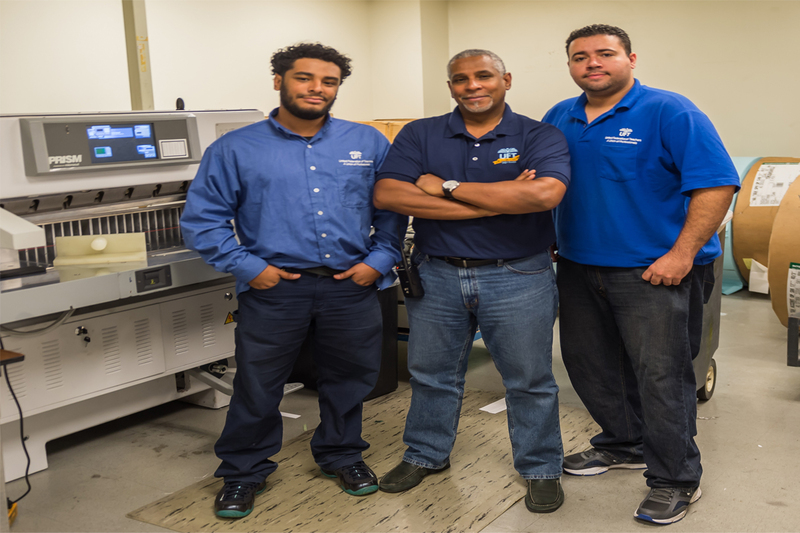 Sandy Alexander (Clifton, NJ) has become the first print company in the world to purchase and install three HP Indigo 10000 Digital Presses. 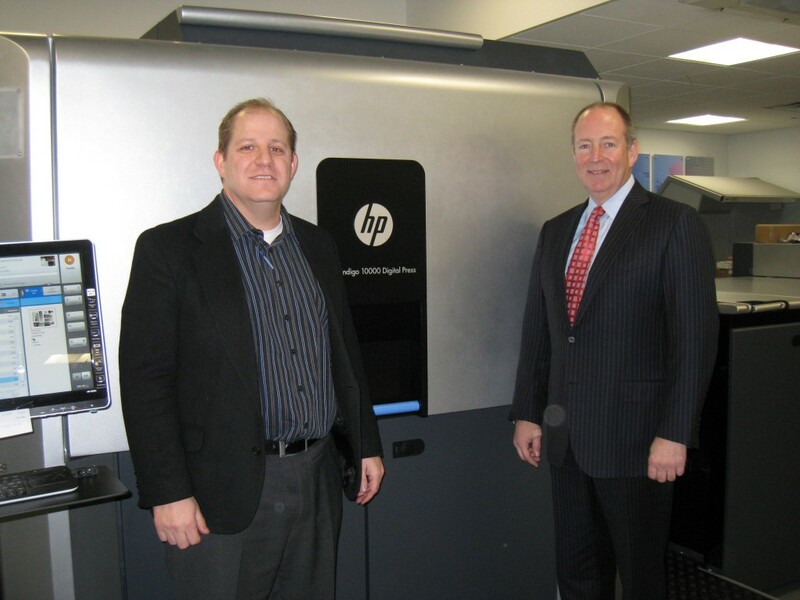 Sandy Alexander was one of the first companies to install the 29″ HP Indigo 10000 Digital Press as a beta customer in 2012. After a successful beta test, the company decided to purchase the press to transform its offerings and provide the capacity needed to support new programs for its clients in the automotive, pharmaceutical, financial, and travel industries. 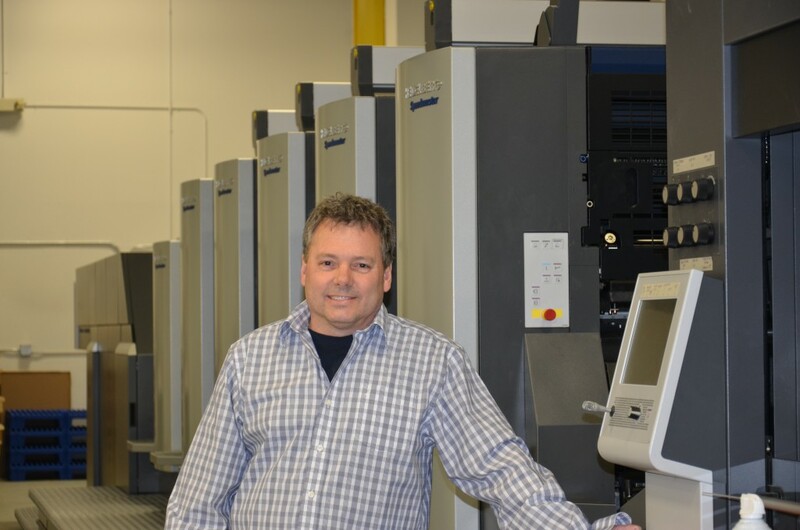 In June 2013, Sandy Alexander added a second HP Indigo 10000 Digital Press to meet growing demand for the larger sheet size and support its expanding capabilities in one-to-one marketing. Now, Sandy Alexander has purchased a third HP Indigo Digital Press to increase marketing and variable data printing capabilities. Sandy Alexander is a leading direct marketing and commercial print provider for companies across the U.S. Sandy Alexander has an unwavering focus on color consistency and quality, making the HP Indigo 10000 a perfect match. With three digital presses the company will increase its digital output, offering faster turnaround to customers, and providing more digital print with high-quality color matching and effects like white ink and raised print. Jim Harris, president of G&H Soho, and lead operator Lynley Bernstein with their new Accutrim HD1680 three-knife trimmer from Colter & Peterson. Now in their 29th year at G&H Soho Inc., Jim Harris and Gerry Burstein have experienced all the highs and lows of owning a business in the printing industry. The Elmwood Park, NJ, shop has always operated in the New York City metro area, and today, business for the niche book printer is certainly on the upswing. Last month, to better handle the influx of hardcover, paperback, spiral, and saddlestitched work, G&H Soho became one of the first shops in the metro market to install a new Accutrim HD1680, a fast, efficient, and flexible three-knife trimmer from Colter & Peterson. They also bought a POLAR 66 reconditioned paper cutter from C&P to cut book covers and jackets. Harris also knows how important it is to seize the moment when business is good. His father and uncle began the business as Ganis and Harris in 1946. Burstein started Soho Studio in 1971. Harris and Burstein decided to combine companies in 1985, becoming one of the first providers in the metro area to use digital information for producing bound galleys on the Xerox DocuTech production publishing system. Business was booming, and the company moved to Hoboken, NJ. Belt-tightening and DocuTech work helped G&H Soho to survive tough times in 2001 when, on the same day, two major clients informed Harris that they were taking advantage of cheaper rates in India for typesetting books. The company survived the recession of 2008-2009 only to see the bottom fall out in 2010. The turning point for today’s renaissance came in May 2102 with a decision to move from Hoboken to the company’s present 12,500-sq.-ft. facility in Elmwood Park. Five months later, Hoboken was devastated by Hurricane Sandy. G&H Soho is now a complete digital shop. An HP Indigo press handles color books, color inserts, and both paperback and hardcover covers. There’s also an Océ press for black-and-white text and a Horizon 270 perfect binder. Harris says the average run length is 100 to 300 copies with the occasional longer run of 2,000 copies. The work consists primarily of 6″ x 9″, 7″ x 10″, and 8″ x 11″ books for academic and university publishers and individuals. What sets G&H Soho apart from other digital book printers is the willingness to print non-standard sizes and customize books to satisfy their clients. The shop is humming, running 15 hours a day during the week with a 10-hour shift on Saturday. Harris says he plans to hire more employees this year, perhaps sooner than he expected. Last September, however, Harris and Burstein discovered that they had a problem in their bindery department. At the time, Paterson, NJ-based Colter & Peterson—North America’s largest independent distributor of paper cutters and paper handling equipment—had just introduced the Accutrim HD1680. User friendly, it offers a maximum book thickness of 3.5″ with trim sizes from 3.15″ x 3.15″ to 11.8″ x 16.5″. Its computer controlled makeready permits through feed or one-man operation, and it has a slew of benefits that are usually not associated with off-line, on-demand three-knife trimmers. “Until I saw it, I originally thought it had too many moving parts and would be down too often,” Harris says. “I was surprised that this was not the case, and it has proven to be a very productive machine with a relatively easy changeover to go from 6″ x 9″ to 7″ x 10″ or 8″ x 11″ or any size in between.” He adds that the trimmer’s two-year warranty for parts was another key factor in the decision. The Accutrim HD1680’s 5º swing angle lets operators make the highest quality cuts and reduce wear and tear while extending the life cycle of the knife. Minor format changeovers typically take less than one minute, and complete format changes can be made in less than three minutes—another important consideration for the G&H Soho team. Left to right, Thomas Cummings, Heidelberg USA; Steven Bogue, Operations Manager, All Color Business Specialties; Dr. Gerold Linzbach, CEO Heidelberger Druckmaschinen AG, William Bogue, Owner, All Color Business Specialties, Ltd.; Robin Karpp, Investor Relations, Heidelberg Druckmaschinen AG; and Harald Weimer, President, Heidelberg USA. All Color Business Specialties, Ltd., recently hosted Dr. Gerold Linzbach, CEO of Heidelberg Druckmaschinen AG, and Harald Weimer, President of Heidelberg USA, at its facility in Deer Park, NY. 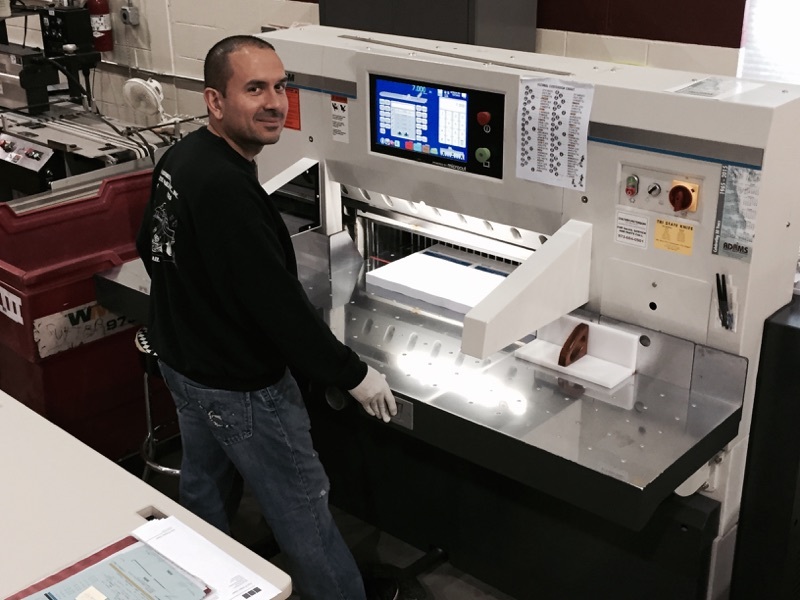 The company, a mainstay of the local market, followed up its May 2013 installation of a Speedmaster XL 75 with a new Suprasetter 106 CtP device, and a Linoprint C751 digital printing system. Founded in 1959, All Color provides a broad range of services to the trade, including prepress, printing, binding and finishing, and mailing. The company counts eight other Heidelberg presses, multiple Stahlfolders, ST 90 and ST 100 saddlestitchers, two POLAR cutters, and a pair of Heidelberg die cutters. Workflow components include Prinect Business Manager (MIS), Prinect Prepress Manager, and Prinect Pressroom manager to promote maximum efficiency, optimal quality, and high profit potential. “It cannot be a coincidence that our success has grown by partnering with Heidelberg,” said company owner William Bogue. June 18 – Sandy Alexander (Clifton, NJ), a leading direct mail and commercial print provider, announced today that it has concurrently brought on line its second HP Indigo 10000 Digital Press while also expanding its capabilities in 1:1 marketing. Sandy Alexander was one of the original beta sites for the HP Indigo 10000 and the first in the U.S. to be operational with the new press. Since the system is primarily used for 1:1 marketing / variable data printing campaigns, the company also has expanded its team of experts and its capabilities in variable data composition, data management, and custom workflows. The HP Indigo 10000 Digital Press is the first B2-format (29.5″ x 20.9″) sheetfed solution from HP Indigo. According to Graff, combining the new sheet size with expanded content management offerings enables clients to more easily implement and manage personalized communications with highly targeted messaging. The two HP Indigo 10000 Digital Presses are complemented by an HP Indigo W7200 digital web press and an HP Indigo 7000 sheetfed press. The company has also applied its proprietary cross-platform color management solutions to these systems. Sandy Alexander Inc. is the largest independently owned, high-end commercial graphics communications company in the nation, serving the needs of Fortune 500 companies and many other enterprises from coast to coast. Sandy Alexander’s broad array of services ranges from digital solutions, sheetfed and web capabilities, webs with in-line finishing and personalization, and wide- and grand-format printing for retail visual merchandising. Sandy Alexander is also a leader in protecting the environment with 100% wind energy; Sustainable Green Partnership (SGP) certification; carbon-neutral facilities for digital, wide- and grand-format production; and tri-certification for chain-of-custody paper. For more information, call Doug Hazlett at (973) 470-8100 or visit www.sandyinc.com. At the HP Indigo 10000 in beta test at Sandy Alexander are Rob Mayerson (left), vice president and general manager, and Mike Graff, president and CEO. B2-format digital presses were the talk of drupa, and many in the industry are still speculating about where these platforms fit into the scope of commercial print production. But, Sandy Alexander (Clifton, NJ) isn’t paying heed to the rumor mill—it’s weighing the merits of B2 digital printing for itself by beta-testing one of the most advanced examples of the technology. The test case is an HP Indigo 10000, a 29.5″ x 20.9″ sheetfed press that HP introduced at drupa and plans to make commercially available this year. Sandy Alexander has been working with the machine since October, becoming one of four sites in the U.S. where beta testing is taking place. The company expects to acquire the machine when testing concludes in March. If all continues to go well, a second HP Indigo 10000 may be on its way to Sandy Alexander’s digital press department as the company gears up to meet what it says is a rising demand from its customers for variable-data printing in color. For Sandy Alexander—a full-spectrum provider of graphic communications services with a history of being first to test emerging production techniques—early adoption of digital printing in B2 format was a predictable step forward. The company, which also offers sheetfed and web offset litho and grand-format printing, has been running digital presses for five years, settling on the HP Indigo platform as the solution that best meets its high-end quality requirements. But over time, those requirements began to outgrow the 13″ x 19″ sheet size that, until recently, represented the largest format that most sheetfed digital presses were capable of printing. A B2 press, on the other hand, can print eight 8.5″ x 11″ pages in duplex, four to a side—a format that gives commercial printers the flexibility they need. That makes B2 the “logical layout” in variable-data digital output for the commercial market, according to Mike Graff, president and CEO of Sandy Alexander. “It would be naïve to think that 1:1 marketing could be constrained to a four-page product,” he says. To expand into B2, Graff decided to replace a pair of existing HP Indigo 7000s with the HP Indigo 10000 he currently is testing and, depending on discussions now in progress with HP, a second installation of the machine. One of the HP Indigo 7000s has been retired, and one remains. To help Sandy Alexander maintain digital capacity while the new B2 press comes fully online, the manufacturer has temporarily provided an HP Indigo W7200 web press that will fill any gaps in production until the second HP Indigo 10000 comes in. HP also is supporting the transition by providing an Indigo technician from the factory in Israel to monitor the testing. Being in the vanguard of B2-format digital printing is “not for the faint of heart,” acknowledges Rob Mayerson, vice president and general manager in charge of digital operations at Sandy Alexander. Nevertheless, testing has progressed to a point where the press now is printing its first live job, a variable-data project running in batches of about 10,000 sheets per day. With VDP, Sandy Alexander can offer its customers printing that lets them leverage what they know about the consumers who are buying products and services from them. Print customized with 1:1 content generates response rates that static promotions can only dream about—as high as 30% in some cases, Hazlett says. Sandy Alexander produces VDP-enhanced materials for automotive, fashion, cosmetic, and retail accounts. Clients furnish the data through a custom content management system that lets them create templated documents, update text and images, and manage their projects in real time. This channel for client input “is as important to the selling proposition as the iron,” Mayerson says. The result is printing that drives behaviors and triggers outcomes by responding to specific consumer preferences and requests. “Hand-raisers”—expressions of interest culled from web sites and other sources—can be translated into brochures and other pieces that deliver precisely what the end-user wants to see. Tens, hundreds, or thousands of pieces customized in this way can be printed in the same run on Sandy Alexander’s HP Indigo 10000. Thanks to the 1:1 power of VDP, says Mayerson, “we don’t send you anything that you don’t ask for”—a benefit that adds value to variable output and enables VDP producers to charge a premium for it. The VDP-capable HP Indigo 10000 can print in B2 format (29.5” x 20.9”) in up to seven colors at about 1,700 sph (4/4). Mayerson says that the B2 platform on which this proposition rests is now running on two shifts at speeds of about 1,700 sheets per hour, 4/4, on both coated and uncoated stocks. He points out that because the B2 sheet offers more than twice the printing area of a 13” x 19” sheet, printing the larger format at the same speed increases productivity in proportion. Like all Indigo presses, the HP Indigo 10000 is an electrophotographic device that uses a printing fluid dubbed “ElectroInk” by HP. Sandy Alexander’s press can run up seven colors of ElectroInk, including Hexachrome, spot colors, and white. For the moment, production is limited to CMYK, fully color-managed with the company’s offset and grand-format processes. The press is soon to receive a field upgrade that will enable it to handle stocks as thick as 18 pt. A press as formidable as the HP Indigo 10000 “is not meant for someone who dabbles,” says Mayerson, who had to raise the ceiling in the digital pressroom before bringing it in. The machine is heavy enough to need a reinforced floor, and it has temperature-control requirements as well. Although, as a half-size color press, the HP Indigo 10000 conceivably could take work away from the equipment in the company’s offset pressroom, that kind of job migration isn’t likely to occur. 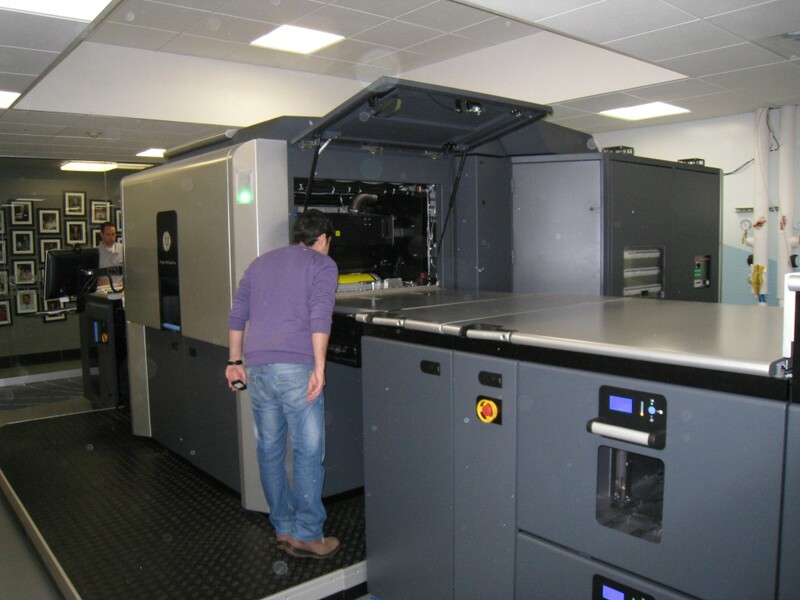 That objective was “very, very secondary” in the decision to install the press, says Mayerson, noting that the machine “was not purchased as a cost-saving device to replace offset.” There would have been scant ROI, he adds, in paying what the company had to pay for its HP Indigo 10000 just to gain a little production efficiency. Besides, the two processes can be teamed profitably in projects like the car owner’s information kit that Sandy Alexander produces for one of its automotive customers. Here, the mailing envelope and the portfolio enclosure are printed on litho equipment. Digital printing customizes the diecut, tabbed, and wire-bound booklet inside the portfolio. The company’s advance into B2 digital production is in keeping with its policy of making continuous technical progress on multiple fronts. Among its other innovations, Sandy Alexander was one of the first printers to use gray balance as a technique for controlling color on press. It also served as a beta test site for GRACoL G7 certification, and it was the first printer in the East to install an eight-unit litho press. “If you stand still, you are guaranteed not to succeed,” says Graff. Pioneering new methods of solving problems for Sandy Alexander’s customers is “just the fabric of the company,” he says.